Today we have four new Dark Souls 2 videos to tide us over until the game's release next March. Fresh from the Famitsu Youtube channel, the gameplay footage seems to be pulled directly from the demo we played at E3 a few weeks ago. You can read my hands-on impressions of the challenging fantasy game here. Each of the brief featurettes stars one of four pre-made classes which were created specifically for the demo. I should note that these classes will NOT exist in the game. I was told we will assign an allotted amount of skill points when we generate our characters, allowing us to create any character archetype we choose. This will give us more freedom than we had with the 10 starting classes from the previous games. You'll be able to make characters like the ones shown if you choose, but you won't be forced into taking 11 points of Resistance along for the ride. There's no boss footage in these videos, so you won't see the Mirror Knight in action. I still believe this demo is from earlier in the game. I'm basing that solely on the fact that the first Dark Souls E3 demo took place in an early stage of that game. This footage is rather dungeony and the enemies might not seem too challenging, but I played this thing and it wasn't easy. Now you can see what I was up against. The Warrior's video starts at the beginning of the demo. This is who I should have played as -sword, shield, great sword, and a bow and arrow. Dude was stacked. He was also strong enough to wield the great sword with one hand. Unfortunately, we couldn't open an inventory screen to see stats or loadouts. The Sorcerer is using a torch, which is kind of a new thing for the franchise. (Skull Lanterns, anyone?) The Sorcerer does what sorcerers do, which is run away and hope his magic saves him. A perfectly valid tactic. The Turtle Knight laydown at the 18 second mark is what brought my time with the demo to an end. Cool lightsaber effect with the magic staff. The Temple Knight is battling fast enemies with slow weapons. That's usually a bad idea. Fun fact: This part of the demo was right before the boss battle. The room with the bonfire has several candles along the walls. When a player dies another candle is lit. There were a lot of burning candles in our demo. I couldn't resist the allure of the Dual Swordsman. This is the class I used. I really missed my shield. I also had a hard time changing between his offensive and defensive dual wielding stances, mainly because I forgot he had two different dual wielding stances as soon as I touched the gamepad. Oh well. I looked kind of cool for a few minutes. I can't wait to die again when the game comes out next year. 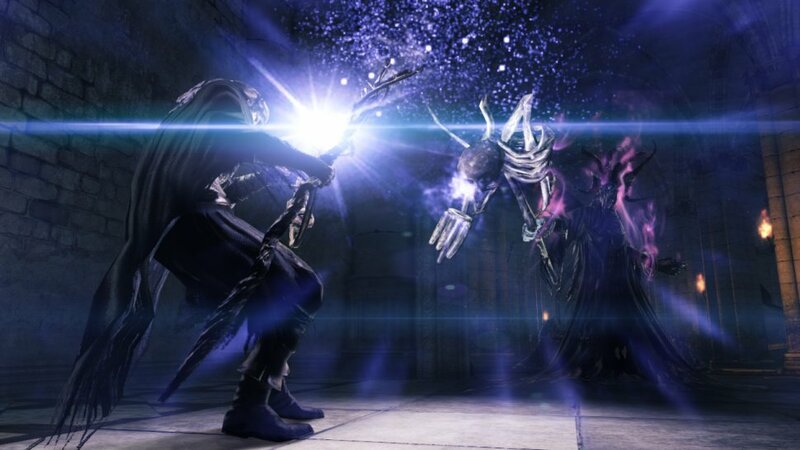 Dark Souls 2 supports three player online co-op with a chance of PvP. It will release sometime in March of 2014 on the Xbox 360, PlayStation 3, and PC.